Elfin Patch: Blocks for ST2 are home.. Blocks for ST2 are home..
Christmas is just around the corner, so I have been having a little play at making just a few homemade cards. Fabric ironed on card with Bondaweb and a few buttons stuck on. Fun to make. Sew and So's of Bungay, with our favourite teacher Lynne Edwards OBE. What a fun day !!! This is what Lynne was teaching us. 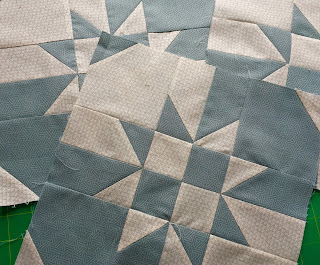 It was the most beautiful quilt that she was in the process of making. I did manage two blocks and finished off another at home, mine will be made into a table runner hopefully. So watch this space.. 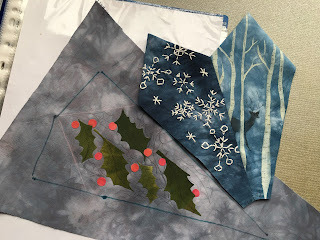 I did enjoy my holiday but now I have to catch up on my Winter Dresden plate block for the Frolic group.. We dyed all the fabrics before I went away so now it's"thinking cap" time for all things winter..
Any ideas for other segments would be gratefully received, 'cos only 9 more to think of and do !! The next job of the day it to decorate the tree. Please leave a message to say you stopped by. Thanks Doti.